This year has not been kind to silver and silver stocks. While silver has gone up by 6.0%, the iShares MSCI Global Silver Miners ETF (SLVP) has gone up by just 3.73%. 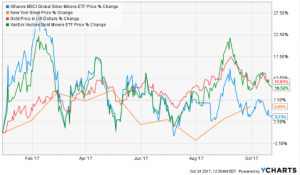 On the other hand, gold and the VanEck Vectors Gold Miners ETF (GDX) have gone up by 11.81% and 10.52% respectively. 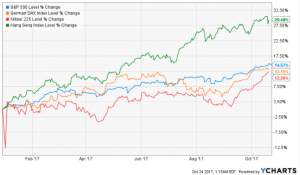 This contrasts with what happened in 2016 where silver and silver stocks outperformed gold and gold stocks as shown below. The weakness in silver compared to gold is attributed to several things. First, this year, geopolitical tensions such as those relating to North Korea have increased. In such situations, investors tend to allocate substantial resources to gold. Second, the global equities market has performed really well this year (exhibit 3). This has made investors move their money to stocks. In the United States alone, stocks have gained by more than $5 trillion. Third, cryptocurrencies have dominated the market this year with most people comparing bitcoin and similar cryptocurrencies as the next gold. This year alone, bitcoin has gained in value by more than $60 billion. I believe that some gold and silver investors have moved some of their funds to the better-performing cryptocurrencies. There are claims of market manipulation whereby, the volume of paper silver is much more than the physical volume, when compared to gold. Caiman Valores has done a good analysis on this which you can find here. As shown in exhibit 4, traditionally, gold and silver have had a tighter correlation but in recent years, the gap between the two has widened. One of the most common indicators of the valuation of silver is the gold-to-silver ratio which reflects the amount of silver that can buy one ounce of gold. Today, silver is trading at $17.4 an ounce while gold is trading at $1277. This reflects a gold-to-silver ratio of about 73.3. 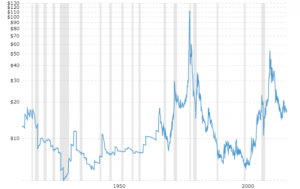 Historically, the ratio has averaged about 15 to 1 in the long term and 40 to 1 in the near-term. As exhibit 4 shows, the ratio is currently at similar levelsas in 2008 before the crash. In the long or mid-term, I believe that this ratio can narrow down as more demand for physical silver increase and supply decreases as projected by the Silver Institute. Silver is definitely undervalued compared to gold and as a stand-alone investment. I consider it likely to be the most undervalued asset in the general investment markets. Silver isn’t keeping pace with gold because the market perception is that gold is a safer play, while the market perceives silver’s role as exposed to economic weakness. But as inflation heats up, more of the public will realize silver’s second role as a store of value and inflation hedge. The second reason for being bullish on silver is the likelihood of a market correction in the near future. While no one can predict accurately whether such correction will happen, historical indications show that the market could correct. Historically, after the end of a recession, it takes less than ten years to see a major market correction. Today, we are about eight years after the 2008/9 recession. Consider the chart below. Couple this with two facts. First, using any measure, including the Shiller PE ratio, the stock market is currently overvalued. Even Goldman Sachs admits this. Second, consider that historically, recessions tend to happen when there is a republican in the Whitehouse. A study by CFRA, and reported by USA Today, showed that every republican president since Teddy Roosevelt has endured a recession. Will Trump be an exception? Historically, during recessions, silver prices tend to go down and then see a sharp increase as investors move their funds to safe havens. This is shown in exhibit 7 below. Exhibit 7: Silver Chart. 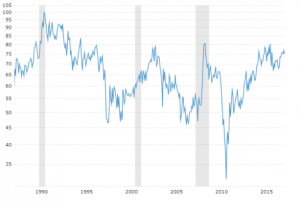 Notice how it reacts during recessions. The third reason to be optimistic about silver and silver stocks is the industrial one. Unlike gold, silver has many industrial uses. I believe that the price of silver tends to be supported by the industrial requirements in times of a strong economy. 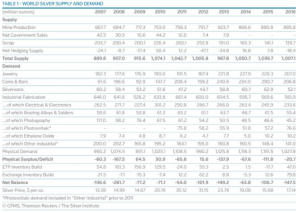 Exhibit 8 below shows the supply and demand of silver in the past ten years. Except for secondary supply from copper miners (which makes up 22% of annual silver mine supply), silver production is expected to decrease at primary silver producers (30% of annual silver mine supply), gold producers (13%), and lead/zinc producers (34%). This is due to the ongoing move towards cost rationalizations and balance sheet deleveraging in lieu of CAPEX growth and acquisitions in the silver, gold, and lead/zinc mining industries. As the supply reduces, the demand for silver and silver products is likely to go up. For example, in the energy sector, it is estimated that in the near future, most energy will come from renewable sources like wind and solar. Silver is used in the manufacture of photovoltaic cells which could lead to more demand for silver. The same can be said about the current wave in electric vehicles where silver is used to enhance the performance of the battery. Another way to predict the increasing demand for silver is a hypothetical one. Trump and his administration have proposed a tax plan that aims to cut taxes across the board. If the tax plan passes, and as wages continue to grow, albeit slowly, chances are that people will increase their discretionary spending. This could lead to an increase in demand of silver-made products considering that the United States is one of the biggest consumers of silver products. While the above factors seem to be positive to silver, a key downside risk is in monetary policy. The Fed has signaled that it will continue increasing interest rates, albeit gradually. A high interest rate environment is usually not good for precious metals. This is because they don’t pay an interest rate. The following exhibit shows that since the time the Fed introduced near-zero interest rates, silver has gained about 65% while the dollar index has gained by about 12%. The person who will be appointed the new Fed chair could influence the interest rate regime which could affect the price of silver. However, Trump has said that he loves low interest rates meaning there are no chances he will name a very hawkish chair. If all the bullish factors I mentioned work out and if interest rates stay this low, chances are that silver and silver stocks will soar. As the final exhibit shows, there is a strong correlation between the silver prices and silver stocks. A week ago, Barron’s published an interest article about gold. In the article, they quoted billionaire Thomas Kaplan who predicted that gold could go up to $5000 per ounce. When Kaplan talks about precious metals, people listen. This is because for more than 30 years, he has made a fortune trading precious metals and crude oil. Then, if his projections turn out to be true, how will silver – gold’s poorer cousin – perform? Another interesting reading on IG.